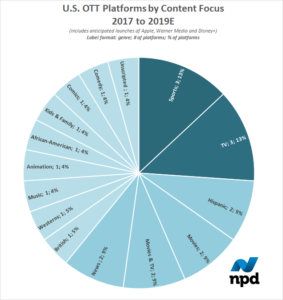 NPD GROUP: Who’s That Nipping at the Heels of the “Big Three” SVOD Services? Above: Even with a steep drop in new platform launches since 2015, relatively few have shut down. January 28, 2019 | The “Big Three” U.S. SVOD players – Netflix, Hulu, and Amazon Prime Video – receive a lot of media attention for their original runaway hits (The Handmaid’s Tale), award-winning series (The Marvelous Mrs. Maisel) or meme-spurring content (Bird Box). Once in a while, news about a smaller player, such as CBS All Access, will pop up, but coverage of these niche platforms remains sparse. Even so, the volume of niche players is surprisingly hefty. 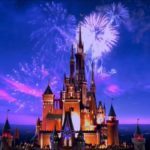 Although there is a tsunami of content available, the “Big Three” don’t fully service the needs of all audiences and some platforms have survived quite well as minor fish faithfully providing specific genres to smaller audiences. 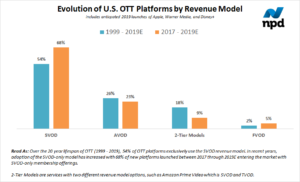 There are 165 over-the-top (OTT) platforms operating in the U.S., not including transactional video-on-demand (TVOD) platforms or TV Everywhere platforms run for MVPD subscribers (e.g., Go90). Many of the niche players have famous parents: Crunchyroll and VRV is run by Ellation Studios, which is owned by Otter Media, which is owned by AT&T-Time Warner, for example. Although the smaller players don’t have tens of millions of subscribers, some have served audiences for up to 10 years and have subscriber bases that are growing, albeit at a much slower rate than Netflix. Platforms like Crunchyroll (launched in 2008, the same year as Hulu), Acorn TV (launched in 2011, the same year as Amazon Prime Video) and CBS All Access (launched in 2014) have successfully carved out value propositions that compel certain enthusiast groups to open their wallets. Platforms have risen to address a range of tastes. 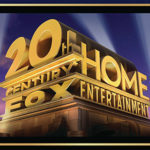 Platforms offering only movies; children’s content; sports; TV; or movies and TV, make up nearly half of all services. The next quartile is regional programming from Asia and Latin America; news; lifestyle; music; unscripted and documentaries. The last quartile is the long tail, which is not to say that some of these aren’t robust services; it just means there aren’t many of them, and that could be a good thing. There are only two British-focused services, Acorn TV and Britbox, for example. Both Acorn TV and Britbox are increasing their subscribers, reaching 450,000 and 400,000 subscribers in 2018, respectively. AMC, which owns Acorn TV and holds a minority interest in Britbox, has identified a burgeoning audience that will pay for specific content and seeks to monopolize this genre with its two services. Peak OTT frenzy didn’t occur until a few years after bingeing became the new normal in 2011. 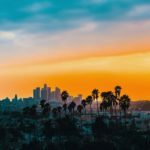 SVOD platform launches doubled between 2014 and 2015, when several linear content creators developed competitive offerings, including CBS News and All Access, Urban Movie Channel (owned by AMC), HBO Now, Showtime OTT, and Tribeca Shortlist (owned by Lionsgate). Relatively few services have shut down (hence the 165 service total), but every year after 2015 there has been a steep drop in new platform launches. 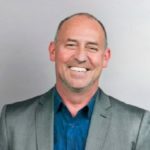 There is now a more measured and calculated approach that relies on crunching data to see what works and doesn’t work when creating smarter content catalogs. When comparing the past three years to the past twenty years, new platforms are choosing not to have mixed revenue models (i.e., AVOD and SVOD, or SVOD and FVOD) and more are choosing to be SVOD-only, in order to lock in subscribers. See the big picture of U.S. OTT ownership by parent company. The landscape is changing where historically dominant content owners launch niche services, effectively creating a pay TV channel strategy. The result is that consumers are ultimately getting what they’ve asked for: namely, to select and pay only for the content they want, which means platforms will capture higher profit margins than they could have in linear arrangements. Kathi Chandler-Payatt is the Executive Director, Entertainment Industry Analyst for the Media Entertainment Practice at The NPD Group. 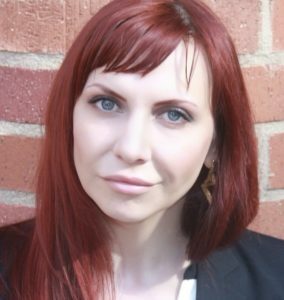 She previously served at 20th Century FOX TV Distribution as the Executive Director of Worldwide Research and Analytics where she developed the Studio’s SVOD analytics strategy. For more information, please visit www.npd.com.